Affiliate linksYessss…more drugstore goodness today! Last week, I posted about the hottest new drugstore makeup for 2017 and now it’s time for the skincare edition. There’s always big news at the drugstores in January but with so many brand new drugstore beauty products already hitting the shelves, this year is already looking fantastic for us beauty aficionados…hoorray! 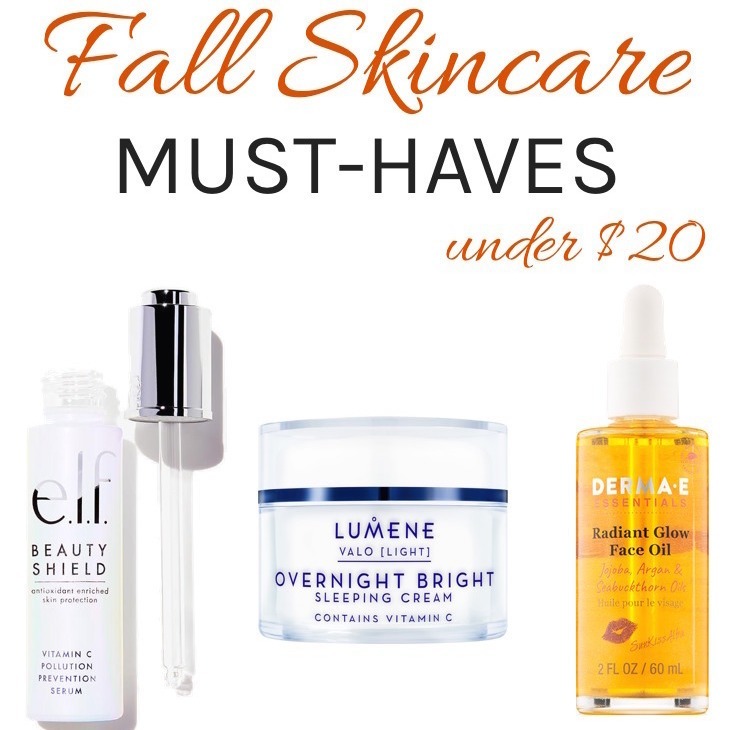 Ahead, the latest & greatest drugstore beauty launches brimming with innovative skincare ingredients, each more on-point than the next and yet easily affordable so you don’t go over budget in the beauty department! From innovative ingredients to affordable takes on luxurious skin-loving treats, these are the new drugstore skincare buys you need to try! 1. Garnier Moisture Bomb The Antioxidant Super Moisturizer SPF30 ($14.99) – This daytime moisturizer is like a blast of healthy hydration for your face! Not only does it offer all day weightless moisture but also has SPF 30 and a cocktail of antioxidants to boot. You won’t ever need an excuse to skip daily sunscreen again! Garnier has also launched a Moisture Bomb The Antioxidant Super Moisturizer without SPF for your night-time skincare routine, so you have all bases covered! 2. Differin Adapalene 0.1% Acne Treatment Gel ($10.73) – This new acne treatment is the first and only FDA approved over-the-counter topical gel to contain a full prescription-strength acne fighting retinoid – adapalene. Not only does it clear breakouts where they start (deep in the pores), but also acts as an anti-inflammatory agent to reduce redness, swelling and prevent lesions before they begin. The best part is that you don’t need to visit your derm to get your hands on this topical retinoid that was previously available only by prescription. It can now be purchased at Walgreens and Target stores. 3. Yes To Cotton Comforting Micellar Cleansing Water ($9) – Whether you are already a fan of micellar water like me or haven’t tried it yet (you should! ), this new offering from Yes To sounds promising! Specially formulated for ultra-sensitive and allergy-prone skin with cotton extract and cottonseed oil to soothe, this micellar water draws out impurities and makeup without drying the skin. Formulated without parabens, SLS and Silicones. Yes To has also introduced a Cotton Comforting Facial Moisturizer which is an airy light, antioxidant-rich soothing formula for ultra-sensitive, irritation-prone skin types to protect against daily environmental stressors. 4. E.L.F. Prep & Hydrate Balm ($8) – This multipurpose, portable skincare stick helps smooth, hydrate and prep skin for makeup to achieve a dewy finish (sounds right up my alley!) The clear, water-based cooling formula has a blend of aloe, grape seed oil, plus shea and cocoa butters for instant on-the-go hydration anywhere, anytime! 5. Lumene Sisu Recover & Protect Facial Oil ($21) – If you want to dip your toes into the face oil trend — but don’t want to overspend — try this new offering from Lumene that treats your skin to a precious blend of antioxidant-rich blackcurrant, bilberry and lingonberry seed oils, along with essential omega fatty acids and vitamin E for super soft, supple skin. I tried out this face oil recently and love its sheer, lightweight texture that makes it feel just as luxurious as the fancy stuff! And it gets bonus points for a soft, soothing scent and gorgeous rose gold rimmed pump bottle…see here! 6. 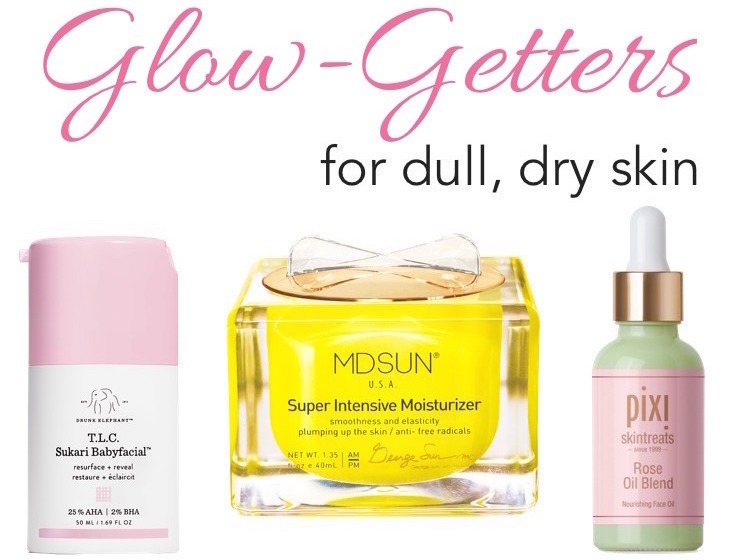 Pixi Peel and Polish ($24) – This new gentle at-home peel helps you get glowing instantly, like a professional salon peel treatment! Just leave it on your face for 5 minutes to let the natural fruit enzymes do their magic while lactic acid gently exfoliates, and papaya & sugar cane polishes your skin for a healthy, radiance. 7. St. Ives Exfoliate and Nourish Coconut Oil Scrub ($6.99) – There are cleansing oils, and there are face scrubs, but this oil-scrub hybrid does double duty! It combines natural exfoliants to slough off dry patches and nourishing grape seed oil to soothe and hydrate….sounds like a keeper! 8. Cetaphil Redness Relieving Daily Facial Moisturizer SPF 20 ($15.99) – Specially designed for redness prone skin, this gentle moisturizer with broad-spectrum SPF (zinc oxide & titanium dioxide) has a neutral tinted formula that’s fragrance-free and non-comedogenic. It soothes, protects and moisturizes sensitive skin while neutralizing the appearance of redness with a subtle tint. Update: I picked this up last weekend and it turned out to be the best drugstore tinted moisturizer I’ve tried so far…truly a drugstore delight! 9. Nivea Nourishing Body Oil ($9.99) – If you’re as much a fan of Nivea’s body cream and lotions as I am, then you’ll also be thrilled for their new body oil! Formulated with macadamia and avocado oils for maximum hydration, it has a dreamy fresh scent and absorbs pretty quickly leaving skin healthy & radiant, not greasy or sticky. And it can be slathered on dry or wet skin! 10. CeraVe Ceramide Boost Skin Renewing Oil Gel ($19.99) – Oil in gel form? The drugstore skincare brands have surely stepped up their game! This unique Ceraplex formula contains 5 ceramides & sunflower blend to smooth, soften and improve skin radiance. It goes on like a gel and then melts into a lightweight, ceramide-rich oil that absorbs super quickly without any greasy mess! And it’s fragrance-free to avoid any irritation issues for sensitive skin….here is my review, it’s a must-have for face oil fans like me! 11. CeraVe Skin Renewing Day Cream SPF30 ($23.99) – This is a great daytime moisturizer with SPF for those of us with dry to combination, sensitive skin. Formulated with 3 essential ceramides and hyaluronic acid for all day hydration, this gentle day cream with SPF won’t clog pores and is also fragrance-free. Plus, it packs an anti-aging punch with non-irritating encapsulated retinol…here is why I love it! 12. Le Petit Marseillais Extra Gentle Shower Crème ($5) – Say Bonjour to Le Petit Marseillais, France’s #1 body wash that is finally here in the US! I received samples of this shower gel in two scents, Orange Blossom and Cotton Milk & Poppy, and both of them smell oh-so-delightfully-fresh-and-fabulous! Inspired by sun-kissed ingredients that bloom in the warm Mediterranean, these luxuriously scented (and sudsy!) shower cremes are truly an affordable indulgence! I will surely be stocking up on these. 13. NYX Cosmetics Stripped Off Cleansing Oil ($14) – Clearly, oils are going to continue to be a big skincare trend in 2017! Formulated with Vitamin E, this is an ultra-lightweight cleansing oil with a refreshing scent that glides right on to remove dirt, makeup and impurities. NYX has also introduced 5 more cleansers in the new Stripped Off range, including NYX Stripped Off Whipped Charcoal Cleanser, NYX Stripped Off Micellar Cleansing Water and NYX Stripped Off Whipped Cream Cleanser. 14. Jergens Natural Glow Wet Skin Moisturizer ($8.69) – Specially developed for use on wet skin, this self-tanner glides on to instantly lock in moisture and gradually build natural-looking color each day. No need to rinse off or wait! Simply pat dry before getting dressed. Use it in place of your daily body lotion and subtle color will gradually appear. 15. Burt’s Bees Skin Nourishment Gentle Foaming Cleanser ($9.99) – Designed for normal to combination skin, this new face wash by Burt’s Bees is formulated with Royal Jelly that contains Vitamins A, B2, and E to leave skin looking healthy and hydrated. I have always been a fan of foaming face cleansers, but with my dry skin it’s not always easy to find a gentle foaming formula. I tried it recently and really like it! Also, it has no parabens, phthalates, petrolatum or SLS. 16. Yes To Tomatoes Clear Skin Detoxifying Charcoal Warming Facial Scrub ($9.99) – Looks like the charcoal-in-skincare trend is here to stay in 2017! This new detoxifying deep-cleaning scrub warms upon contact with your skin to help draw out pore-clogging dirt and impurities. Plus, it comes with a built-in deep cleansing YESonic Detox Brush that enhances the cleansing and exfoliating benefits of the scrub. 17. Dove Shower Foam ($5.97) – This new spin on Dove’s classic body wash is an airy light, instant lather that cleanses gently, leaving skin feeling smooth and refreshed. The bubbly body wash is available in four different varieties : Shea Butter with Warm Vanilla, Cucumber & Green Tea, Deep Moisture and Sensitive skin. I tried out two of the scents and really LOVE them both…here is why this new shower foam is such an affordable indulgence! 18. Aveeno Positively Radiant 60 Second In-Shower Facial ($6.64) – Formulated with soy and lemon peel extracts, this oil-free facial treatment works with the steam of your shower to deeply but gently exfoliate all traces of dirt, oil and dead skin – in just one minute. Just swap it for your regular cleanser once or twice a week! 19. SheaMoisture Organic Shea Butter Body Lotions ($9.99) – When it comes to deliciously scented bath and body products, SheaMoisture has always been one of my favorites! And that’s why I’m excited to try their new collection of deeply hydrating body lotions that are made with fair trade and natural ingredients, including certified organic Shea Butter to soothe parched skin. Available in four varieties – All-Over Hydration, Rough Skin, Sensitive Skin and Extra Dry Skin – the lightweight lotion formulas are fast-absorbing and sensational smelling, and cruelty-free. 20. Pixi Sun Mist ($18) – This sheer mist with broad spectrum SPF 30 makes it easy to refresh your defense against the sun through the day. Infused with aloe, bamboo and chamomile extracts, the non-greasy soothing formula applies easily and helps reduce skin irritants by neutralizing free radicals. Which of these new skincare releases are you most excited to try? Let me know about your favorites in the comments! Hi Harshleen! Thank you so much for this article. I’ll definitely be coming back to this article to find my new go to drug store products!